[ #Mixamo #Animation ]San Francisco, CA – Aug 19, 2014 – Mixamo, Inc announced today that it has launched a brand new pricing strategy geared to meet the needs of animators and studios at every level. The new strategy includes more affordable pay-per-use pricing for Mixamo’s services, as well as three cost-effective and flexible pricing tiers, called “Starter”, “Indie” and “All Access”. The new pricing goes into effect immediately and can be viewed on the Mixamo pricing page. In addition to paying for Mixamo’s services on a “pay-per-use” basis, the new pricing strategy consists of three main pricing tiers. Pay per Use - Some Mixamo users just want to purchase one animation or one session of auto rigging. Those prices have now been reduced and simplified, lowering the per use cost of Mixamo’s services and making them easier to understand. Starter - Starting at $25/month or $250/year, this brand new pricing level targets beginning animators and new users of Mixamo’s services. It includes five animations per month, access to the entry level character creator software Fuse Basic, unlimited auto rigging of Fuse characters, and a free 15-day trial of Mixamo’s facial animation software Face Plus. 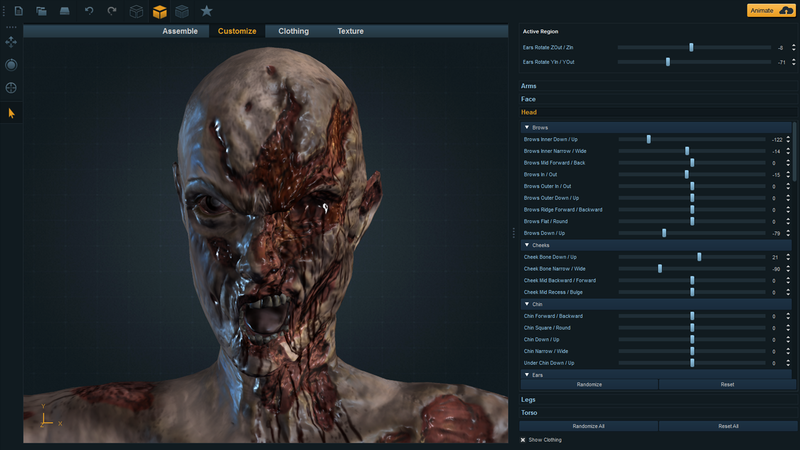 Indie - This mid-tier pricing gives animators 10 animations per month, the full-featured Fuse character creator, unlimited auto rigging of Fuse characters, and full access to Face Plus and Mixamo’s level of detail (LOD) services, Decimator and Skeleton. All Access - While not new, this pricing level has been re-designed from top to bottom. In addition to everything offered in the Indie package, All Access includes 50 animations/month, unlimited auto rigging, and premium support. It costs $150/month or $1500/year. If users sign up for the yearly plan, there is no cap on the number of animations they can access. Mixamo’s animation service is designed to save animators time and money by making it easier to model, rig and animate 3D characters. The new pricing adds even more savings into the process. While exact savings may differ depending on the complexity of a given project, animators can expect to save hours in rigging alone using the Auto Rigger, and even more time using Mixamo’s easy-to-use character creator software Fuse and/or it’s pre-made animations. Even advanced animators using Autodesk® Maya® or 3ds Max® can import their models into Mixamo’s auto-rigger and apply animations in a matter of minutes, rather than hours or even days. The new pricing is available to anyone who signs up for a Mixamo account and is available starting today. Users can stop and start monthly payments at will, depending on the length of given projects.